The article uses the Eco Marxist perspective to look at deforestation and the impact it has on Earth in terms of soil erosion, air pollution and the threat it places on plant and animal life. The world is changing. Many countries are modernising and adapting to new ways of living in the 21th century. Population growth is on the rise and there is a constant need for industrialisation and urbanisation in order to meet all the social and economic needs that come with modernity. Rapid demographic and technological changes have placed a lot of strain on the environment as a lot of plants and animal species are on the brink of extinction. All these changes, driven mostly by those who seek profit at all cost, have degraded nature’s ecosystems. Environmental problems have become the new normal in modern day society. Global warming, mudslides, drought, deforestation, floods – the list is endless. Every year environmentalist organisations release new findings and statistics on the continued degradation of the environment. These environmental problems range from acid rain, deforestation, climate change, damage to the ozone layer or water pollution. The causes of these problems are continued plunder of the Earth’s natural resources with the aim of industrialisation and enhancing human life with very little, if any, regard for the planet which the resources come from. Situations like these cause conflicts in society as it often pits the environment and the people who live in it versus the capitalists who seek to gain from it. These ecological conflicts, whether global or local, occur because economic prosperity is more often linked with the unsustainable use of the environment. An example of this is the deforestation of many hectares of land with the aim of acquiring timber or for the purposes of human settlement. Environmental problems and ecological conflicts are studied by various social sciences including environmental sociologists, with the purpose of taking into account the physical and social impact economic development has on the environment and the people. This is because environmental impacts are being felt all around the world and if the situation does not change life will be difficult for future generations. With that in mind, this article will explain the Eco Marxist perspective, its key aspects, its view on environmental issues and how those issues affect different classes of people differently. Through an Eco Marxist view, the paper will look at deforestation and the impact it has on Earth in terms of soil erosion, air pollution and the threat it places on plant and animal life. Eco-Marxism is a political ideology that fuses the Marxist doctrine of anti-capitalism with ecology, anti-globalisation and various pro-environment policies. The birth of Eco-Marxism was likely due to a vacuum in the science discourse, in that ecology does not have a social analysis. Ecology alone lacks the capacity to fully understand and unpack the ever-changing economic and political climate in the world. Eco-Marxists view the expansion of capitalism through globalisation as one of the root causes of environmental degradation, war, inequality and poverty (Kovel and Lowy, 2001). Eco-Marxists, though inspired by Karl Marx and his critique of capital, are sometimes critical of many socialist policies but they maintain their platform of Green politics as a foundation of their movement. Since Eco-Marxism is a combination of ecological research with Marxist thought and action, it mostly views the on-going environmental degradation as the result of a destructive economic and political system – capitalism (Foster et al, 2010). The premise of Eco-Marxism is that the root causes of social injustice and environmental degradation is a capitalist world where the attainment of profit at all cost is the mantra. According to Karl Marx (1976) “labour is the father of material wealth, the earth is its mother”. In Marxist thought, humans and nature are the two principle agents in the creation of wealth, thus the need to have them both controlled. The Eco-Marxist perspective is of the view that the force (capitalism) that subjugates the proletariat is the same force that subjugates and destroys the Earth, and its destruction will usher in the emancipation of both. Another key analysis of capitalism from this perspective is that capitalism treats nature as the “other”, external to human existence and a free gift it can use any way to fulfil its profit seeking endeavours. Burkett and Foster (2006) note that “capitalism’s failure to incorporate into its value accounting, and its tendency to confuse value and wealth, were fundamental contradictions in the regime of capital itself”. In this sense, Karl Marx saw that capitalism as a system depended on the accumulation of value even if it was to the detriment of nature. Foster et al (2010) note rather chillingly that capital has a parasitic relationship with nature, that of a vampire sucking the blood of the Earth. Kovel and Lowy (2001) state that the expansion of capitalism causes environmental degradation “rampant industrialisation and societal breakdown”, which arise from globalisation. It causes habitat destruction, pollutes the environment and leaves communities without the ability to produce food on their own. According to Porritt (2007) in every country studied “we are continuing to destroy natural habitats of every kind through the conversion for profit purposes”. Recently there has been a rise in eco-capitalists or sustainable developers. Their goal is to save “the planet from ecological destruction wrought by capitalist expansion…through the further expansion of capitalism itself, cleared of its excesses and excrescences” (Foster et al, 2010). Such individuals see no contradiction between continuing and unlimited accumulation of capital – which is at the core of liberal society—and the conservation of nature. They seek to do this by creating and expanding a new sustainable capitalism that will take nature and its reproduction into account. According to Eco-Marxist John Bellamy Foster (2010) “In reality, this vision amounts to little more than a renewed strategy for profiting on planetary destruction”. Capitalism’s disregard for nature was echoed by retail analyst Victor Lebow in a quote that sums up the modern times: “our enormously productive economy demands that we make consumption our way of life. We need things consumed, burned up, worn out, replaced and discarded at an ever-increasing rate” (Porritt, 2007). In Eco-Marxist thought, alienation from refers to the separation that humans living under capitalism suffer from. This is alienation is in the form of humans being distant from the products of their own labour, being distant from nature, themselves and other human beings (Bottomore et al, 1983), with self-alienation the root of it all. In essence, humans are a part of nature, humans are a part of what they produce (the materials to produce come from nature), other humans are a part of nature – so to be separate from these things is to be alienated from our human nature and nature as a whole. In a capitalist viewpoint, the alienation of the working class is an individual problem, whereas Eco-Marxists view it as a social issue. Pepper (2010) writes that, “…since through labour we produce things, and since in producing things we change the nature of what we are, then labour is a means of creating what we are – of self-creation”. In capitalism, workers through their labour, produce things that change themselves and nature. However, due to the low wages they earn, they are most likely not going to be able to purchase what they have produced. An example is workers building skyscrapers while they will not be able to afford living in one. Another aspect is that of classism. The working class are confined to living in the outskirts of the city or in urban slums that are congested compared to the affluent houses of the employers. These areas are often poorly managed, have little or no sanitation and are far away from the city, which means low-income workers have to add transportation to their growing expenses. Also, the proletariat is away from a healthy natural environment (nature alienation) because he/she wants to be close to work, all tied to the demanding nature and actions of capital. In order to continue its survival, capital gnaws away at the resource base of its wealth – the soil and the worker (Pepper; 1993). Deforestation refers to the massive clearance of the Earth’s forests or trees so that the land can be used for non-forest use. This land is to be designated for human settlement, agriculture, animal farming or mining. Deforestation is a result of a few causes. Firstly, the continuing population growth has placed pressure in governments, as they are constantly seeking land to settle its citizens and re-adjust spatial planning (Holdgate, 1992). Secondly, deforestation is driven by commercial interests. Most of that is for agricultural purposes, as farmers are in constant need of a few more acres of land to plant more crops or for livestock grazing. Others could be logging, as wood is needed to make things like furniture and paper. In this process roads are built in for transportation, leading to further deforestation and environmental degradation. Thirdly, deforestation is used by opposing forces during times of war as a military strategy in what is called scorched earth. This is to destroy the habitat and expose the enemy of, who use the forest for cover and resources. Humans have been destroying forests for centuries, mainly for agriculture and grazing livestock. This was done in a way that afforded nature to be able to recover as populations would migrate or leave the forest to grow. However, in modern times, tropical rain forests are being altered or cleared out at an extremely fast rate than ever before. According to the United Nations Food and Agricultural Organisation, tropical forest clearance in the world between the years 1980 and 2000 was at “figure 15000 x 100 square kilometres or 12.5 percent of the 1980 area”. This is shocking when considering the size of countries like Fiji, Brunei, Laos. The loss of tropical forest can have devastating consequences like soil erosion as well as hydrological imbalances in the soil, the altering of regional atmospheric water balance, which could affect weather patterns (Whitmore and Sayer, 1992). The latter could cause an addition of carbon dioxide into the atmosphere, contributing to global warning. 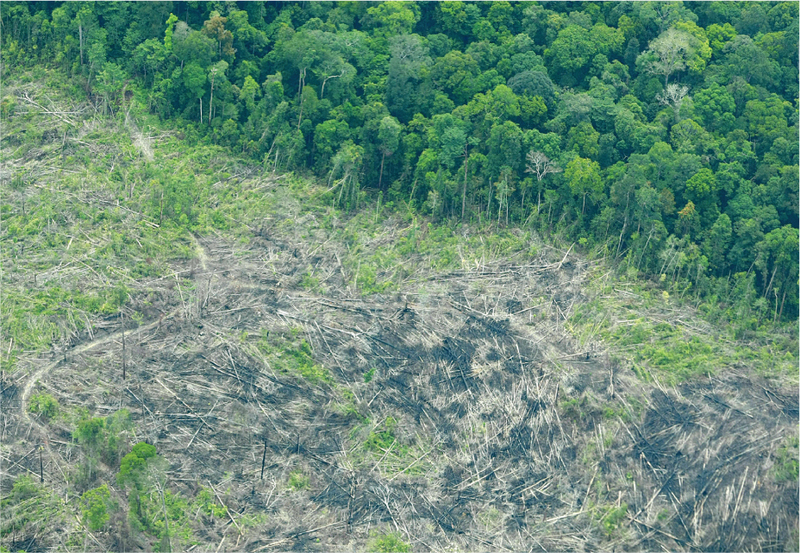 Deforestation of tropical areas is already destroying the various plant and animal species present there and as Myers (1983) puts it “the [greatest] concern over the loss of tropical forests is that there is a considerable body of evidence to suggest that it is leading to an unprecedented loss of biological diversity”. This means that species that do survive will have to find it difficult to survive, as they will have lost most of their genetic diversity (Whitmore and Sayer, 1992). When taking a historically materialist analysis of capitalism, it can be said that the individual consumer cannot be blamed for the current situation. Eco-Marxists consider the mode of production itself, which is “the pyramid of productive forces surmounted by productive relations, which constitute capitalism” (Pepper, 1993). Simply put, this means the way that humans alter with nature under capitalism is the root cause for environmental degradation. Capitalists continue to chop down trees at an unprecedented rate with the aim of increasing their agricultural production, increase livestock and to make furniture and wood, with little regard for nature. This is due to the Enlightenment Ideal that nature is a “free gift” that is handed to mankind gratis (Foster et al, 2010) and he can therefore do as he pleases. This mentality has led to desertification and dustbowls in areas that once had lust forests. As noted above, most of the deforestation is done for agricultural purposes, however Eco-Marxists are against capitalistic agriculture as they consider it irrational as it is constantly on the search for a quick buck, thus leaving the land barren (Pepper, 1993). Eco-Marxism considers deforestation as environmental imperialism in the sense that capital exploits the land of its trees with no regard for the future generations. When the damage is done they skip to the next area. Companies that arrive promising job opportunities are, according to Eco-Marxism, misleading the people as this is “progress in the art, not only of robbing the labourer but of robbing the soil (Marx, 1976). People are forced to leave their homes, workers are paid slave wages, vast amounts of lush forestation and ecosystems are destroyed. Due to capital’s constant need to accumulate and reinvest to gain more, Eco-Marxists are critical of eco-capitalists who spring up and want to invest in re-forestation. Karl Marx (1976), in a quote that could be said addresses eco-capitalists says “progress in increasing the fertility of the soil for a given time, is a progress towards ruining the lasting sources of that fertility”. Nature is diminishing at the hands of human actions. Forests are being cleared, animal species are suffering and biological diversity is at a risk of extinction. Tropical rainforests, as a source of not only wood but also mineral resources underneath them, face the highest rate of being deforested. This essay has assessed the impact of deforestation in particular that of tropical rainforests, through the lens of an Eco-Marxist in order to determine the impact of capitalist production on the Earth, working class and the people living around areas facing deforestation. From the above it can be said that capitalism is a system that is mainly concerned with accumulation, using whatever gains it acquires to ensure that its survival is sustained. It is a system driven by profits above all and will continue this path even if it harms the labour and most importantly, the Earth that it feeds from. It was also established that capitalism alienates the worker from the Earth, produce themselves and other human beings as well. All this in an effort to make the worker into a tool that fulfils the employer’s mandate. Lastly, Eco-Marxism seeks to emphasise that humans are a part of nature and nature is a part of humans, therefore the exploitation of one means the exploitation of the other as they are linked. Bottomore, T; Harris, L; Kiernan, V; Miliband, R. (1983). A dictionary of Marxist thought. Oxford. Blackwell. Pepper, D. (1993). Eco-Socialism- From deep ecology to social justice. Routledge, London. Whitmore, T.C; Sayer, J.A. (1992). Tropical deforestation and species extinction. Chapman and Hall. London.